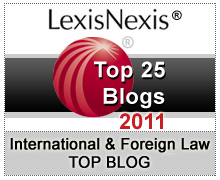 IPG Legal is proud to announce that IPG’s Korean Law Blog has been designated by LexisNexis as one of the Top 25 Blogs in International & Foreign Law. Additionally, AVVO’s Blog List consistently ranks The Korean Law Blog as one of the Top 25 Legal Blogs in the World and many of our attorneys receive their highest designation – Excellent. We are proud of these accomplishment and hope you will visit LexisNexis to see the other nominees and winners HERE. We hope next year The Asian Law Blog and The China Law Blog will also have the opportunity to be nominated by LexisNexis and placed on the AVVO Blog List. Previous Post:KOR-US FTA Passed this Thursday?